True Built Home – Customer Experience Development | ASTRALCOM - Content Strategy, Conversion Marketing and Customer Acquisition. True Built Home – Customer Experience Development | ASTRALCOM – Content Strategy, Conversion Marketing and Customer Acquisition. When competition is fierce, you need to leverage your unique competitive differentiators and demonstrate true value to your customers. In the case of True Built Home, a Pacific Northwest homebuilder, when they build a new home, they include what other builders typically charge for as upgrades. So, we developed a “That’s Included! message and created a unique supportive customer experience landing scenario to help convey the real value to homebuyers. After only 20 days of activity, we delivered the following significant improvements in key performance indicators. The time visitors spend on this new landing page is 44% better than the entire website average. The bounce rate on this new landing page is 9% lower than the entire website average. Goal completions increased by 68% over the previous landing page. 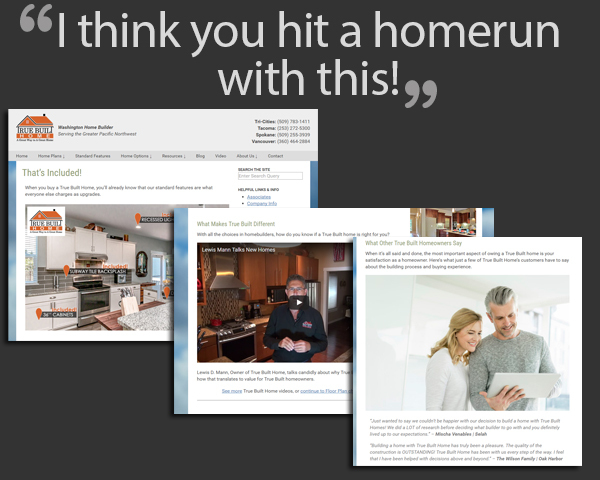 “I think you hit a homerun with this!” was the response we received from True Built Home. Whether you want to hit a homerun, or score a touchdown, we’re your go-to team. Reach out to us and we’ll be glad to discuss a lead generation plan to elevate your game.